2. Place the ribs (having washed them) in a casserole dish facing up. 9. 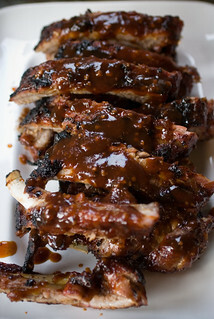 Cover the ribs with BBQ sauce as you like and Q them on medium flame/heat 'til the sauce glazes onto the ribs. 10. Repeat step 9 as often as you like. I usually do 3 times. Save some of your sauce. Heat it up and dribble a bit onto the cut up ribs... and leave some on the table for dipping.